Hello my friends and welcome to Share Your Cup (SYC for short). The party where you share the things that make you happy. 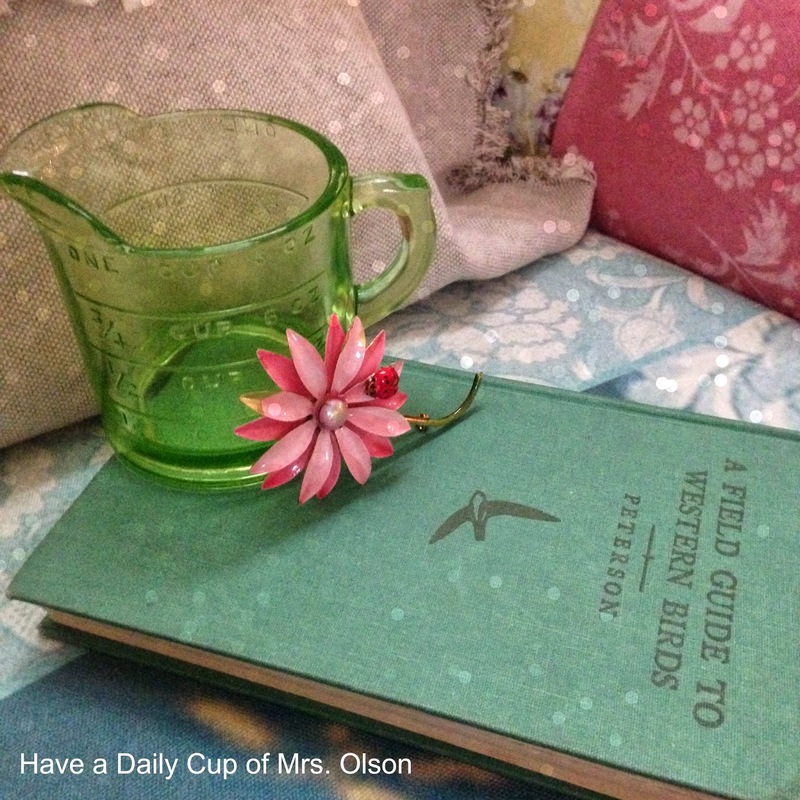 One of my favorite things to share are my 'vintage' finds. I have really enjoyed sharing them on Instagram and facebook. I would love to have you follow along with me! Also, let me know if you are on either and I will follow or like you as well. Here's a sampling of what I have been sharing. I try to share something that brings me happiness each day. At the same time I hope that it might brighten yours! The photos have been taken with my phone so they aren't the best. 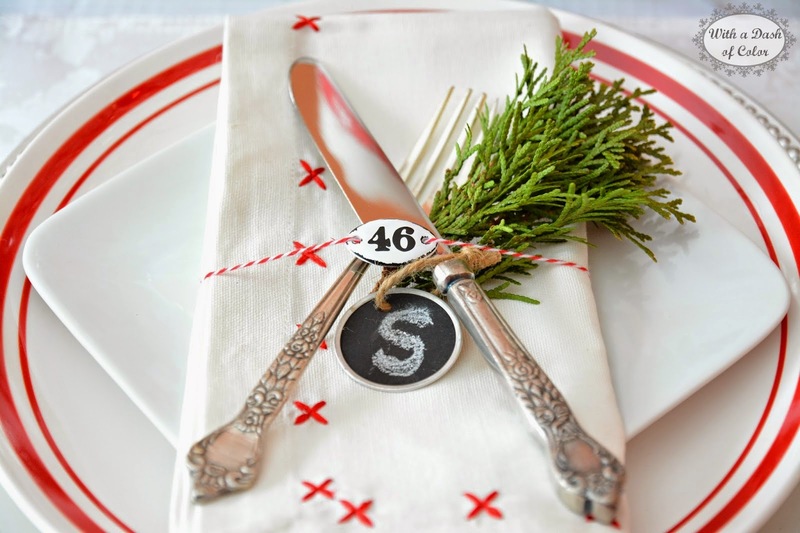 I absolutely adore the way Poppy from With a Dash of Color dressed up her silverware! 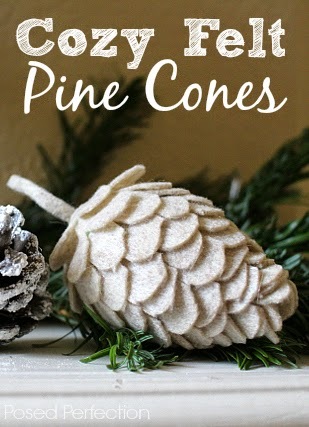 Nici from Posed Perfection created the cutest felt pinecones for Winter. And how cute is this pom pom garland made by Vickie from Ranger 911? Sarah Beth from Magnolia Lane has been crocheting the sweetest little hearts. 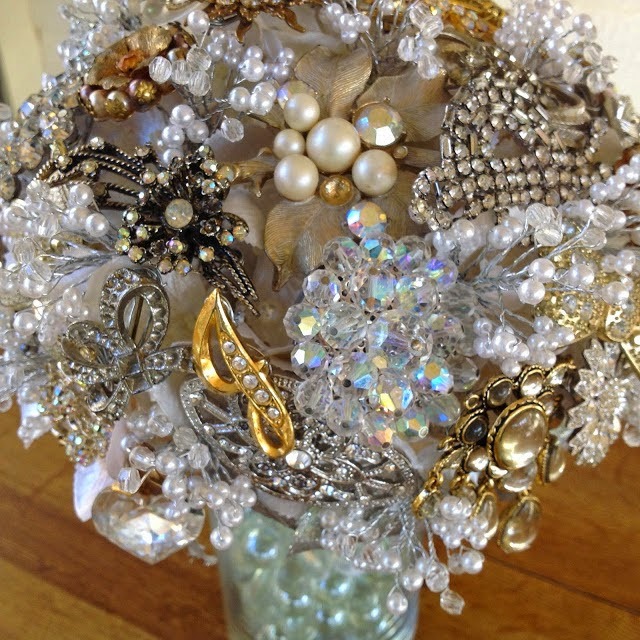 Julie from Renaissance Mermaid created this gorgeous bridal bouquet for her daughter's wedding using some items that belonged to her grandmother. 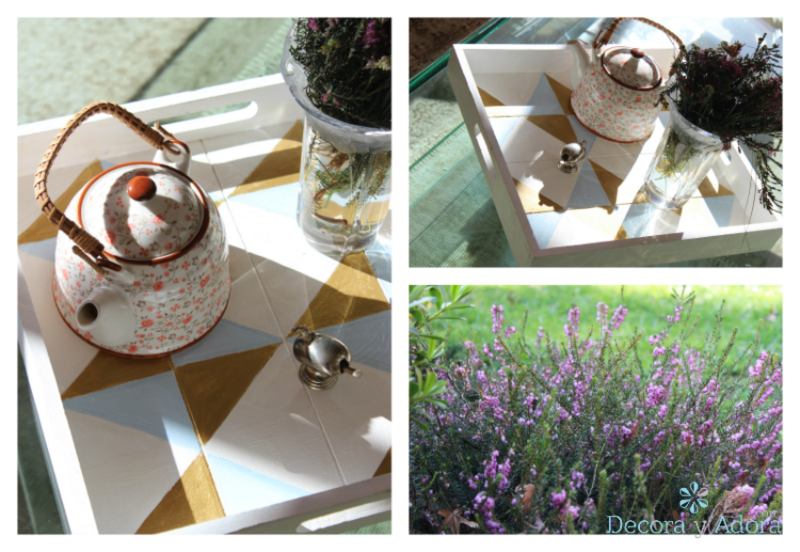 Angelica from Decora y Adora dressed up a plain tray with triangles. Thanks so much everyone for sharing and please grab my button if you were featured. always so much eye candy here :) Thanks for hosting us each week! 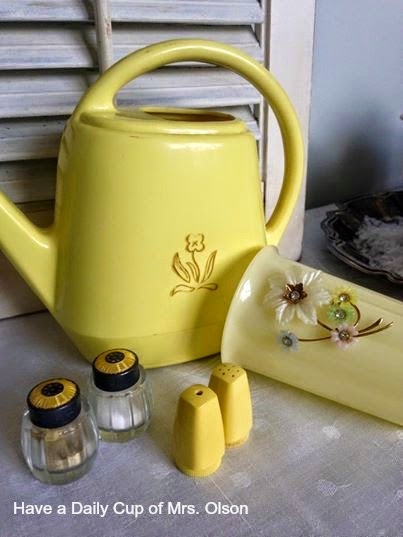 You always share the prettiest vintage finds! The features are all wonderful, too. Thank you for hosting and have a wonderful week. What in the world is up with our muddy weather? I long for tulips and Spring! I hope you had a wonderful Christmas... Love the vintage stuff - LOVE the brooch bouquet. Have a Wonderful "dry" rest of the week, I hope! I love how you take your photos. You have such an eye for color and composition. Beautiful. Great features too! 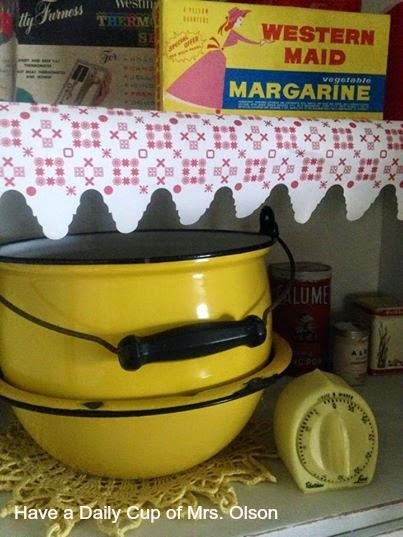 Lots of great vintage goodness...and I spied Fiesta ware! Great features too, from some of my favorite reads. THank you, Jann, the party is always fun to visit and join. 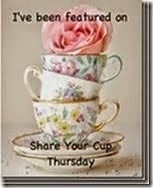 Hi Jann, thanks for Share Your Cup Thursday no. 132. I enjoyed seeing all your cheerful and bright vignettes, the Umbrella Girl with posies was very sweet. Have a great week. What great treasures....thanks for sharing with us. Thanks for including me in the wonderful features this week, Jann! Love your little head vase! Thanks for hosting once again and have a great weekend! 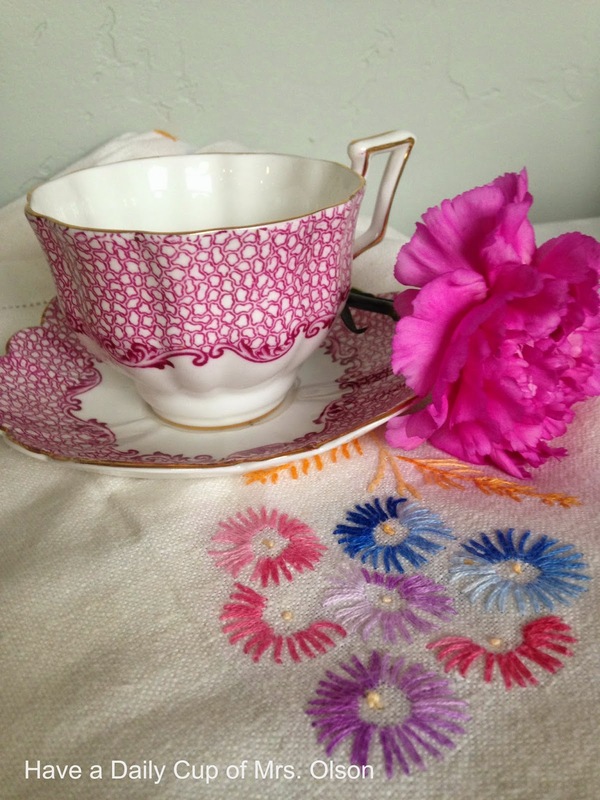 Gosh, love all the features and love your treasures, very pretty tea cup,but I love tea cups.. We follow each other on Facebook, and now I'm following you on Instagram. Mine Instagram is bare minimum, but started today I planning on using more. I am an "oldie but goody" and it takes me longer to get the hang of things! FYI: your instagram link above does not work. I did find you through a search on Instagram. Thanks for the party and all linked up! Wonderful finds, Jann. Thanks for hosting your party. Thanks so much for hosting Jann! Love all your finds! What a fun party and what pretty features. Oh and your phone took some great pictures, they are vibrant and caught my eye! I am on Instagram too-I'll look for you! I think the photos from your phone turned out nice. Thank you for this weekly party. I like the old book very much. 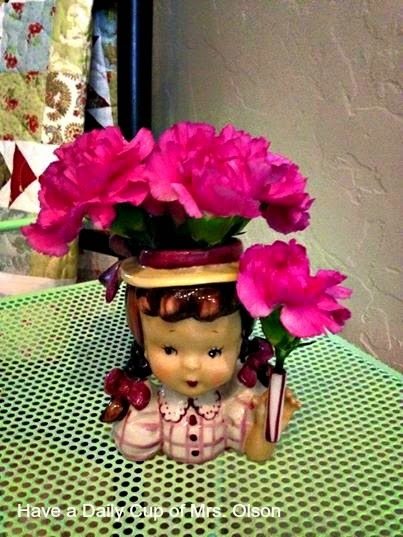 Love all your vintage goodies... especially that cutie girl head vase! Adorable! The features from last week are awesome... love that pine cone! Thanks so much for including my puffy hearts at the party! Hi dear Jann! Your finds are so beautiful! And speaking of beautiful, so are the features. There is so much talent and inspiration out there. Hugs to you! 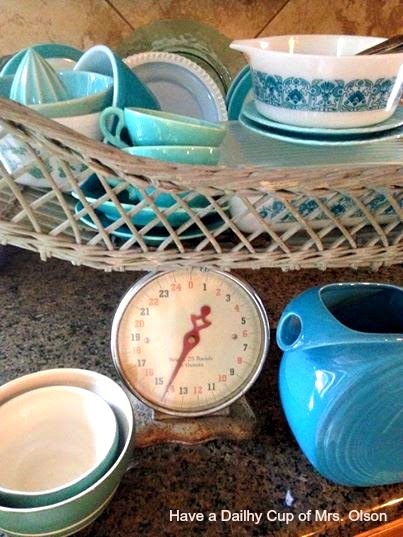 Love your vintage finds Jann! Thanks for hosting! I didn't know you hosted a party?! Thanks! I just found your party! I know you used to follow me. I will be following you and hope you will come back:):) Thanks for hosting!! I'm having trouble getting back in the blogging groove. Thanks for hosting, your party always has great inspirations! Hello Jann, Hope you're having a good party! Loved all the old but goodies of your treasures you shared! I will visit a few ladies and stop and say hello! Thanks for hosting. Hope to see you and your bloggy friends at Funtastic Friday. I'm inspired from all the great links! Thanks for hosting a terrific party. I didn't link up anything because of my late visit but I have enjoyed checking out the winter decor at so many wonderful blogs. But it was Brown, who speaks a little Spanish, asics australia sale who unearthed the tragic facts behind Ruiz’s eccentric facade. A decade earlier, two youths had shot and robbed Ruiz in the shop. It took him two years to walk again. asics running shoes sale Widowed and returning to work, he discovered the licence had changed hands, meaning all stockists needed to reapply for an account. “cheap asics australia They sent a lot of forms to fill in,” he told Brown. “I’m 65, I’ve lost my wife, I can barely walk.” He ripped the forms up. You found some lovely treasures, Jann-and your photo's really showed them off!!! Thank you for hosting another inspirational party! Have a wonderful weekend!!! My Pillow Passion. . .
Winter TIME Afternoon Tea. . .
Snippets of Winter. . .